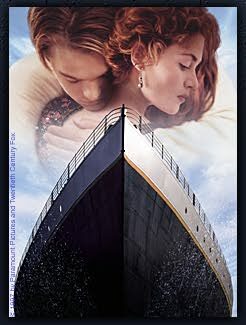 Don't be fooled by some misleading reviews, and uninformed assumptions... Titanic is a great movie. Not only do we enjoy top-notch and breathtaking special effects, as expected, but we are treated to a complex and elegant love story with uniformly wonderful acting. James Cameron may have been thought of as a low-brow action thriller type director by some, but not for long... Titanic indisputably brings Cameron to the "A" list of Hollywood directors. The real Titanic lies 400 miles off the coast of Newfoundland, Canada and two-and-a-half miles under the ocean surface. The underwater shots of the actual shipwreck (discernable as those where only one of the undersea explorer vehicles are visible in the shot) are seamlessly integrated into the movie and breathtakingly in their own right. Leonardo DiCaprio is a megastar of heretofore unprecedented proportions. As Cameron points out, instead of just every teenage girl in the West wanting him, the rest of the world will too. There is a thousand expressions in Leonardo's every glance. But Kate Winslet is the real surprise of the movie. (Rose DeWitt Bukater) As the tortured Ophelia in Kenneth Branagh's adaptation of "Hamlet" she left no doubt about her acting prowess, but in Titanic, her compelling work actually upstages the billion dollar marine pyrotechnics. Victor Garber, (photo at left) seemingly missing since Godspell, reappears in a memorable way as the ship designer. See director James Cameron in QuickTime interview , or a film preview, or a cut from the soundtrack. Mediadome offers a complete Titanic resource page. PARAMOUNT PICTURES AND TWENTIETH CENTURY FOX are the intellectual property holders of the movie "Titanic" and holds copyright over the movie, character and storyline. ON... makes no claim to the rights of any of these items and has no intention to infringe on the rights of PARAMOUNT PICTURES AND TWENTIETH CENTURY FOX.